Perfect for a spring or summertime dessert. Use traditional key limes or regular limes if your local store doesn’t carry key limes or key lime juice. Cut butter into small pieces, about ½-inch think. Place pieces of butter in a bowl and place in the freezer until ready to use. In the bowl of a food processor, combine gluten-free all-purpose flour blend, lime zest, salt and sugar. Pulse just until blended. Add in the butter pieces and pulse until the dough forms into coarse pea-sized granules. Add the ice water, one tablespoon at a time until the dough begins to pull together. Remove the dough from the food processor and mold into a large ball. Place the dough into a gallon-sized ziplock bag or between two layers of plastic wrap. Using a rolling pin, roll the dough into a large disc. Refrigerate for 2 hours. Meanwhile, to make the filling, combine egg yolks and lime zest in the bowl of a standing mixer. Using the whisk attachment, beat the yolks and zest until they are light and very fluffy, about 4 to 5 minutes. Slowly add in the sweetened condensed milk and lime juice and mix on low-speed just until combined. Preheat oven to 350 degrees F. Remove the crust from the refrigerator and let it sit on the counter at room temperature for 10 minutes. Place the disc of dough on top of a large piece of wax paper that has been dusted with all-purpose gluten-free flour. Sprinkle a bit more gluten-free flour on the top portion of the disc and and roll the dough until it is approximately 12-inches in diameter. Carefully transfer the rolled-out dough to a 9-inch tart shell and press it into place. 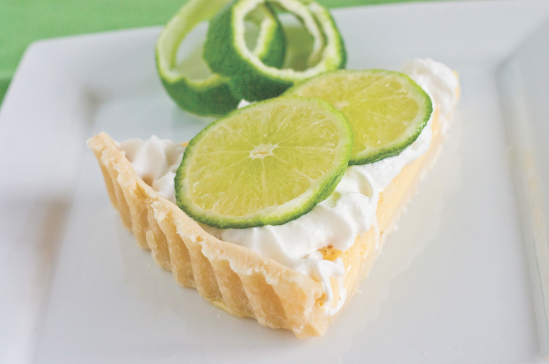 Pour the key lime filling into the tart shell and bake for 10 to 12 minutes until the center begins to set. Remove tart from oven, cool to room temperature and then refrigerate for 2 hours before serving. Top with fresh whipped cream if desired.